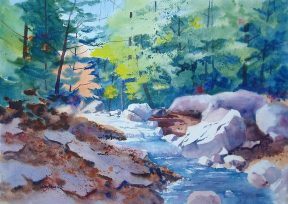 Students copy the instructors demo painting or paint from their own photos with instructors input. Paper: Any good quality 140 lb. paper, not watercolor pads. Full sheets can be cut to smaller sizes or blocks of any size. Good paper and brushes are very important. 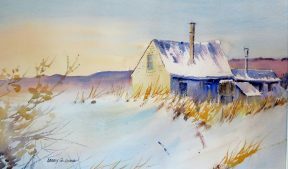 I use Arches bright white 140 lb. rough full sheets. Paint: Student quality for beginners are OK. Windsor Newton Cotman, Grumbacher Academy or Van Gogh offer lots of colors. I use mostly Windsor Newton Artists colors as follows: alizarin crimson, cadmium red medium, aureolin yellow, lemon yellow, raw sienna, cobalt blue, french ultramarine blue, cerulean blue, prussian blue and burnt sienna. You don’t need greens, purples, greys or oranges. The only colors in my palettes that are not primaries are the two siennas and Daniel Smith Perylene Green. Brushes: Perhaps most important are good brushes. Escoda and Cheap Joes Golden Fleece are good inexpensive round brushes #2, 8 and 10. I also use Danube Artists Quills from Jerrys Artarama #6. 10 and 14. Those 6 and possibly a #5 or 6 rigger are enough. Palette: Cheapjoes.com or jerrysartarama.com have many inexpensive plastic palettes. Choose one with at least 12 deep wells, at least two mixing areas and a cover. A rigid lightweight board large enough to tape your paper to the surface. Masking tape: A one inch wide roll is enough. Paper towels, an old rag or tissues. The desire to be an artist started when I was in a grade school art class. 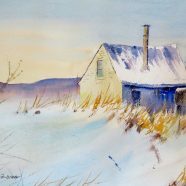 My first watercolor painting was completed in 1965. There have been many distractions along the journey: military service, raising a family, pursuing my career and golf to name just a few, but the desire to paint and create always endured. During the 1980’s I chose to stop playing golf so I could set aside more time for painting. That decision made quite a difference, enabling me to complete five or six paintings a week and fifteen to twenty during a five-day workshop. Over the years, I’ve had a wide range of training experiences, beginning with a three-year extension course at Rhode Island School of Design. I have attended many art classes at the Worcester and Fitchburg Art Museums and a score of workshops taught by masters in the field like Don Stone on Monhegan Island, Maine, Edward Minchen, Judy Wagner, Ron Ranson, Hillary Page, Peter Spataro, Alvaro Castagnet, Don Andrews, Tony Couch, along the Maine Coast and in Europe with Carlton Plummer and lately with Joseph Zbukvic and David Taylor.